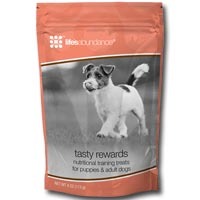 PLEASE NOTE: We do not stock any Life's Abundance products for pick up at the kennel. You must order it directly from Life's Abundance by using our links. If you do not use our links we will not receive notice from Life's Abundance that you have made a purchase. We have gotten your Miniature Australian Shepherd puppy off to a great start by feeding him Life’s Abundance Premium Health Food. Now it’s time to take into consideration the benefit of the treats you feed your puppy! Good behavior should be rewarded, but often training treats are empty-calorie treats with no nutritive value and include undesirable ingredients. 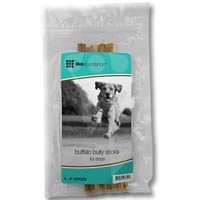 We strongly recommend that you only feed treats that can help to support overall health. Tasty Rewards are wholesome nutritional training treat made from New Zealand-raised chicken and lamb. They’re loaded with proteins, minerals, vitamins and essential fatty acids with no added chemical preservatives or artificial coloring. Healthy teeth and gums are an important consideration for your Mini Aussie's overall health. Poor dental hygiene can result in health consequences throughout the whole body, not just the mouth. A sound, highly-digestible diet is a good foundation, but there are additional nutrients that can help support healthy teeth and bones. 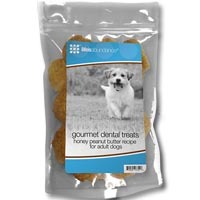 We highly recommend Life’s Abundance Dental Treats. These treats are wonderful because they contain a variety of healthy whole grains, high quality proteins plus a hefty helping of calcium and phosphorous, which are important nutrients for strong bones and teeth. 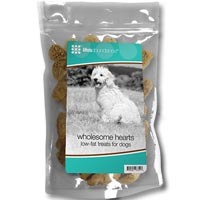 Wholesome Hearts are delicious, low-fat dog traits. They are perfect for dogs that could stand to shed a few pounds and the rich flavor and delicate aromatic spices make them simply irresistible. Fortified with L-Caratine to help the body utilize fat, these treats have a wonderful aroma of cinnamon, nutmeg, allspice, and cloves. Gluten free, no artificial preservatives or colors. 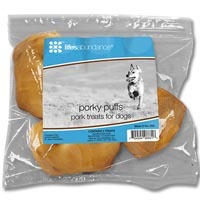 Along with the dental treats we recommend providing your Mini Aussie with Life’s Abundance Pork Puffs. Packed with high-quality protein, Porky Puffs chewable treats are non-greasy and contain no artificial preservatives or flavors. And with no artificial colors, you won’t have to worry about hard-to-remove stains in your carpet! And Porky Puffs are appropriate for dogs of all ages. Dogs come in all different shapes and sizes but there are two things they have in common … they love to chew and they love meat! Now you can give your dog real chewing satisfaction that's not only srumptious but also all natural and completely healthy with our free-range, grass-fed buffalo chews.